The Sony NEX 5n shipped with no sync port and no hot shoe. There was no way to trigger off-camera flash. With a little work, adventurous users can change that. The result? High ISO flash photography with the Sony NEX 5n. The SunPak Click N’ Stick features a bendable, flexible shaft with a mini ball-head and a suction mount. 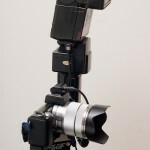 It makes a good flash mount, if you take certain precautions. Will you be a grinch or a snapshooter this Christmas?